Ex-Navy Carrier USS Forrestal Sold For 1 Cent : The Two-Way The vessel is famous for a 1967 incident in the Gulf of Tonkin during the Vietnam War, when a stray missile triggered a massive fire that killed more than 130 sailors. 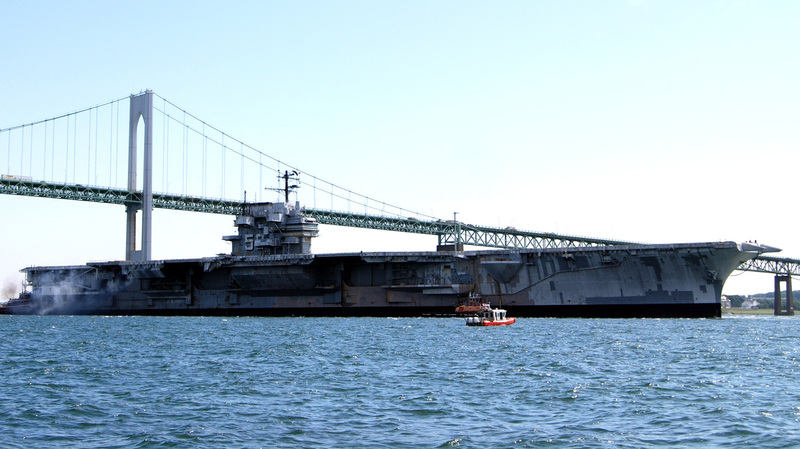 The decommissioned aircraft carrier USS Forrestal departs Newport, R.I., for a three-day cruise to Philadelphia in 2010. The U.S. Navy's first "supercarrier" is being sold for just 1 cent to a ship breaker. The USS Forrestal, launched in 1954 and decommissioned in 1993, is the first of three conventional (non-nuclear) carriers due to be scrapped in the coming years. The Forrestal is best known for a devastating fire in 1967 that engulfed the ship's flight deck, killing 134 sailors and wounding 161 others. Navy crewmen try to put out a fire aboard the USS Forrestal in the Tonkin Gulf, off the coast of Vietnam, on July 29, 1967. In a statement, the U.S. Navy says All Star Metals, which was awarded the contract for the ship, is developing a final tow plan to get the ship "from its current berth at the Navy's inactive ship facility in Philadelphia to All Star Metals' facility in Brownsville, Texas. The ship is expected to depart Philadelphia before the end of the year." The minimal payment reflects the net price proposed by All Star Metals, "which considered the estimated proceeds from the sale of the scrap metal to be generated from dismantling," the statement said. "[The] Forrestal was in the Gulf of Tonkin the morning of July 29, 1967, for the Vietnam War effort when stray voltage triggered a rocket to launch from an F-4 Phantom on the flight deck. "The rocket struck an armed A-4 Skyhawk — piloted by a young Lt. Cmdr. John S. McCain III — rupturing the fuel tanks and sparking a chain reaction of fires and explosions on the deck, which was parked full of planes. 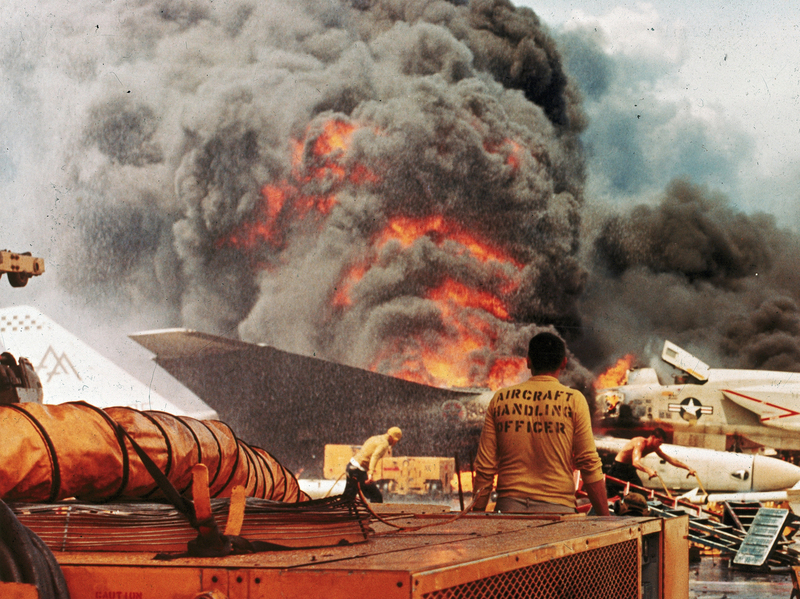 "The crew fought the flight deck fire for an hour, but other fires blazed into the next day." The Navy says it made the Forrestal available for donation in June 1999 as a museum or memorial, but didn't get any viable offers.